Below-grade waterproofing provides challenges which are quite different from, and often more demanding than, super-structure works. Site conditions are typically less than ideal, accessibility may be limited, the stresses on the waterproofing system are more varied, and repairs – if necessary – can be more disruptive and costly. 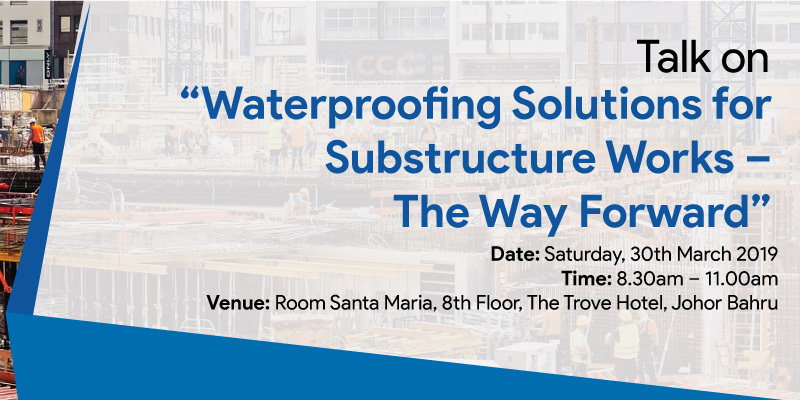 This presentation looks at common defects and problems, the different levels of dryness required for basement structures according to their functions, and selection criteria for waterproofing systems. It aims to help Designers understand the considerations which go into selection of best-fit solutions. Mr. Gary Tan graduated from Carleton University, Ottawa - Canada, in 1985 with a degree in Civil Engineering. He is a member of the Institution of Engineers Malaysia and is registered with the Board of Engineers. Mr. Gary has more than 30 years of direct industry experience in working with designers and consultants to provide waterproofing solutions for many types of concrete sub-structures and super-structures. His earliest project involvements included the KLIA Airport and KLIA Air Traffic Control Tower, KLCC Suria, First Solar Wafer Factory in Kulim, Great Eastern HQ and Hong Leong Bank HQ in KL, and many others. In his first exposure to the industry, he gained valuable practical experience when he worked for a specialist waterproofing contractor from 1985 to 1990. After that, he served 21 years in a multi-national company which manufactured/supplied construction chemicals for waterproofing, industrial flooring, sealants, CFRP, concrete repair and protection products. Besides leading the sales team, his responsibilities included project site management of installation contract works. Mr. Gary Tan joined MAPEI Malaysia in 2012, heading the Building Line Division and leading the company’s drive to work with specifiers and project owners, contractors and specialist applicators in offering innovative & cost-effective solutions. His broad exposure, ranging from manufacturing to installation contract works, provides him with useful all-round knowledge for sharing with industry professionals. In addition, Gary has full access to the MAPEI Group’s wealth of expertise in this field. Mr. Simon Yap graduated with a Diploma in Architecture from Polytechnic Port Dickson in 2001, and started work as a technical assistant in an architectural practice. This early part of his career in an architectural environment and his subsequent 16 years of experience in a wide range of construction chemicals set the foundations for progression to his current role as the Market Field / Product Manager for Waterproofing Systems in MAPEI Malaysia. Mr. Simon’s first experience in construction chemicals started with a company which specialised in flexible joint sealants. His knowledge expanded to waterproofing, and his experience in on-site applications continued to grow after he joined a multi-national manufacturer of a wide range of construction chemicals where he was directly involved in contract works & project management, promoting application best practices and providing on-site technical support. He also worked closely with consultant engineers, developers, architects and consultant QS to analyse project construction methods with the aim of identifying cost-effective material specifications. Some of the notable projects he has worked on include the Tuanku Jaafar Power Plant Port Dickson, KVMRT Bukit Bintang Underground Station, BSN Shah Alam, F1 International Circuit refurbishment works, East Coast Mall, Plaza Mont Kiara, and most recently, the Damansara City Mixed Development & Arcoris Mont Kiara.